Microsoft SharePoint Server and Duet Enterprise for Microsoft SharePoint and SAPare closely integrated. What you see on a page in a SharePoint site depends on your permissions. You might discover that different options appear on two different pages. For example, you might notice that an option appears inactive, or that the option does not appear on the page. Your permissions determine what you can see, and SharePoint Server enables a site designer to control permissions at many different levels. Your permissions can differ between sites, and can differ between content items on the same site. For example, you might find that you have different permissions on a list of reports and on a list of tasks, and that the menu options you have for one are not be available the other. 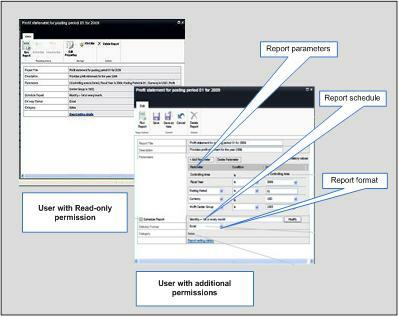 SharePoint Server security helps make sure that users can only interact with report options for which they have permission. Thus, if you do not have permissions to see or modify the schedule for a report, the report schedule options should not appear on your report request.